WAFO handles Gaussian and transformed Gaussian waves by their correlation or power spectrum functions. It can estimate the spectrum or correlation and also find a transformation to make the model (marginally) Gaussian if it is not so from the beginning. It can also simulate from a given spectrum. One of the main feature of WAFO is its built in function for calculation of exact wave characteristic distributions, such as trough-crest wave period or wave length distribution. WAFO can also handle time-space relations and contains routines for directional seas and simulation of directional seas. Fatigue analysis via the rainflow distribution can be performed, both empirical data analysis and damage calculation, simulation of load sequences from power spectrum or from an observed rainflow matrix, or calculation of a rainflow distribution from the power spectrum. Two simulated wave sections with a spectrum for wind driven waves. In WAFO one can extract individual waves and make a statistical analysis of their properties, wave period and wave length, as well as different definitions of wave amplitude, can be used and analysed. Spectrum to wind driven waves. WAFO contains many standard statistical techniques for estimation of spectrum, correlation function, extreme value distributions, etc. 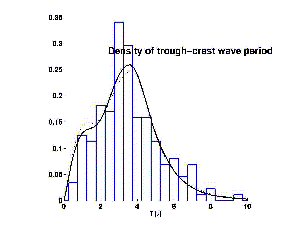 Empirical distribution of trough-crest wave period as observed in the simulated waves. 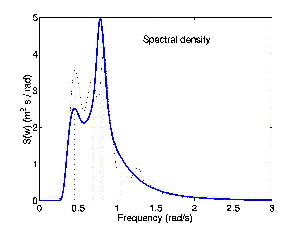 Solid curve is the theoretical probability density as calculated by WAFO for a Gaussian wave with the given spectrum. 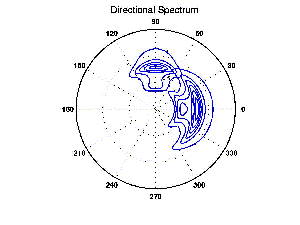 Directional spectrum with swell and wind driven components. Simulated directional sea. WAFO can handle directional waves and encountered wave properties for a ship with specified course and speed. It can toggle between time domain and space domain properties. 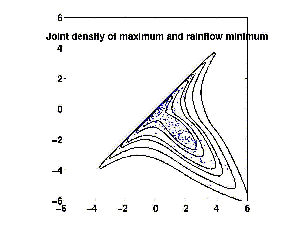 Observed and theoretical joint distribution of Rainflow minima and maxima. 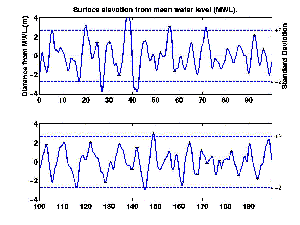 One of the strengths of WAFO is its capacity to calculate exact distributions for fatigue characteristics, such as the Rainflow cycle amplitude for Gaussian and transformed Gaussian loads.